The Friends of the Bruce Freeman Rail Trail is a group of citizens working in partnership with state and local governments toward the completion of the proposed rail trail. This is a volunteer group which is active in moving forward the state and federal issues required for the planning, design, construction, and maintenance of the rail trail, fundraising activities and support for rail trail issues at local town meetings. The Friends work to ensure that all the questions, concerns and other issues are addressed by working in concert with neighborhood associations, each town government, and the citizens of the towns. The group holds monthly meetings with speakers who are experts on various rail trail issues and/or have been involved with creating rail trails and activities related to rail trails. The Friends sponsor a range of activities from rail trail clearing days to support for environmental awareness events such as Earth Day to other community events. 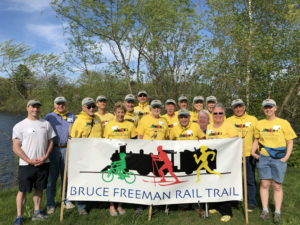 The Friends of Bruce Freeman Rail Trail is an incorporated 501(c)(3) non-profit organization, and all donations are tax-deductible to the full extent allowed by law. A presentation from our 2007 Annual meeting provides a concise overview of FBFRT activities and goals.